The use of snow white doves at weddings can be traced back to ancient Greek and Roman times when doves were gifted from the bride to the groom. Even in biblical passages, the appearance of the snow white dove came to symbolize holiness, innocence and fidelity. Building their nest together, the white dove falls in love and mates for life; therefore, they are instinctively drawn home where safety of their nest and a loving mate awaits them. Like many couples today, they take turns in caring for their young ones. They both sit and turn the eggs until they hatch and share the responsibilities of keeping them warm until they have feathers of their own. There are many types of doves which are members of the pigeon family. However, the two species that are commonly recognized to symbolize love for one another is the snow white ring-necked dove used by magicians and also found in pet stores and are not used for release as they have poor flying ability and no homing instinct. The white doves that are used for ceremonies are white rock doves, which possess a natural “homing” instinct for up to 600 miles. These awesome athletes were developed over the past thousand or so years using very selective breeding to augment their keen instinct to home. This instinct is sharpened by intense training on a daily basis by the handler which allows them to return to their loft following release. These magnificent birds cannot be released in heavy winds, fog or rain. They must be released on the location of the ceremony in time to get home two hours before sunset to ensure their safe return. 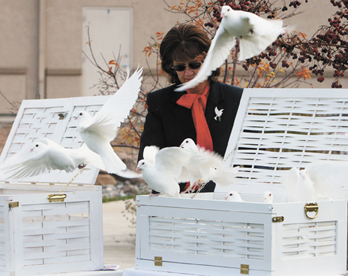 Rodney and Betty Dalley of Loma, Colo., had no idea that they would have an interest in white doves until, in 2001, their youngest son, who was a police officer, was killed. When they went to the officers memorial service in Boulder, Colo., white doves were released as part of the service. They had never heard about the white dove before that time, but it was such a beautiful sight they decided they would get “a few birds” so they could watch them fly around the house. Rodney built a small loft for 12 white doves they had ordered from Arizona. They were not really “bird” people other than parakeets their children had when they were young, but when the doves arrived they saw how special they were, and were hooked. Betty joined a group on the internet and started learning about these wonderful birds. After ordering more doves from Kentucky they had over 30 doves, so Rodney had to build more lofts with more nesting boxes for the baby fledglings that were arriving. They ended up finally with a building, (14 by 36 feet) loft with everything under one roof, office/storage room for the release cages, sink for bathing the birds, work counter and feed room. They now have over 150 birds. The birds have turned out to be a full-time job. Besides keeping the loft clean, feeding and watering, they keep a “hawk lookout” while letting them “loft fly” to keep in shape. They have a weekly bath and a yearly vaccination. The babies have to be taught how to get in and out of the loft and how to find their way home from anywhere in the valley. They limit their doves to short distance ceremonies and take them out 25 miles to exercise twice a week. The Dalley’s keep busy during the year with graduations, weddings, funerals and of course JUCO where the birds are a big hit. They donate several releases during the year for the Special Olympics, and Relay for Life. Preparation for release begins with a bath the day before and decorating release cages. On the day of the release, time involved depends on the amount of birds needed, the types of release cage, if it is to be “hand release,” flock release or both. At funerals the doves bring a sense of peace and releasing the “spirit bird” brings a feeling of closure. It is totally different at weddings. The birds seem to explode into the sky in celebration. It is as if they know what they are doing. The white dove is truly an exceptional creature. I would like to thank Rodney and Betty Dalley for all the information they have given me. For more information, please go to http://www.BettysDoves.com.